Recently, schools were closed due to a "credible threat" that would have impacted a significant number of schools and students. Everyone was saying, "better safe than sorry," but many of the responses seem to reflect the repercussions of the times we are living in. Fear cannot be the primary motivator of our thoughts because it makes us fearful. Living in fear is draining, exhaustive, and crippling. Faith produces the opposite effects - rejuvenation, revitalization, and growth. I would like to suggest we live by faith instead. Fear is the opposite of faith. If we only trust in the things that we can see in this world we will be fearful. On a regular basis, we are dealing with terrorism - domestic and international, economic downturns, natural disasters, health scares, unemployment. We are consumed by what the future will look like for our children. There is always something to worry about! However, the Bible provides excellent comfort on why we need not live in fear. Ultimately, when we are fearful or living in fear, we are only relying on ourselves, and we know our limitations. We think with a limited mindset. But God is not like that - He's not like us in this regard - He is above all, understands all, and controls it all. Instead of relying on my limited self, I will trust and hold on to an unlimited God and in so doing live by faith instead of fear. If we are ever in fearful situations, I know God gives us the faith and what comes with it, to make the best decisions at the time. The verses above are only a snippet of what God says about fear. If you spend significant time pouring over the Word and take these words to heart, you will recognize how much God cares for us and does not want us to be fearful regardless of what we are dealing with. You will have to choose to believe what He says, not what you think. This will take time; new circumstances will always provide opportunities for choosing faith. You won't perfect this on this earth, but you can get pretty close because you are not doing this alone. 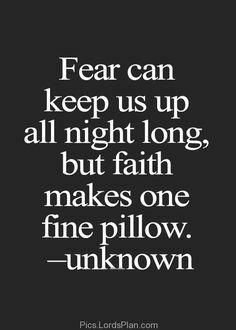 Faith or fear - what will it be for you?